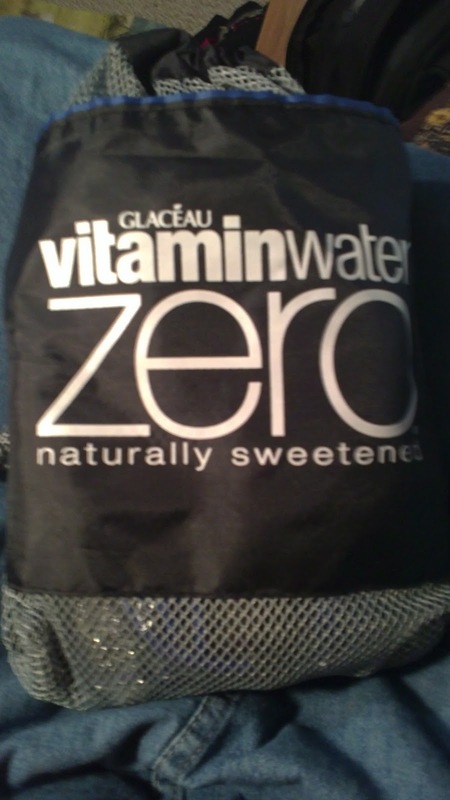 Hope's Cafe: VitaminWater Review and Giveaway!! Do any of you drink VitaminWater? I love the stuff, and drink it A LOT! I vary between my 2 favorite flavors (Raspberry Apple and Dragonfruit), and trying out the new flavors. I recently had the opportunity to review a couple flavors from VitaminWater, and I am impressed! Just when you think there's no way to make a flavor you'll like better...they do! The Stur-D VitaminWater is a mix of Blue Agave, Passion Fruit, and Citrus. The strongest flavor is the passion fruit, and I love it! I have to admit...this one didn't even make it to the refrigerator before I tasted it. Yep, I opened the box, and had a (few) sip(s) before putting it in the fridge to chill! VitaminWater has done it again, and created another delicious flavor! I also got to experience the newest VitaminWater Zero flavor. It's called Rhythm, and is a Starfruit-Cirtus blend. I like the VitaminWater Zero varieties because, obviously, they have no calories. (My favorite Zero flavor is the Mixed Berry). I personally didn't care for the Rhythm flavor as much..still very good, and yes, I would drink it again. It's just not something I said "Wow! That's great!" about. However, I let my brother try this, and he really loved it! Included in my VitaminWater pack was a handy little mesh bag with a jump rope, stretch band, and pedometer. These are really nice to have a few small items to help with getting (or staying) fit! They're not too big, and fit perfectly in the little VitaminWater bag, so you can take them anywhere! Whether you're going to workout at the gym, or on a trip, this is a great little kit to bring with you! VitaminWater sent me a second pack (the Bag, Stretch Band, Jump Rope, and Pedometer) for a giveaway!! Go to VitaminWater or VitaminWater Zero, and tell me a flavor you'd like to try! 1 entry-"Like" VitaminWater Zero on Facebook; tell them you came from Hope's Cafe! 1 entry-"Like" VitaminWater on Facebook; tell them you came from Hope's Cafe! 1 entry-Follow VitaminWater on Twitter! This giveaway ends Friday, January 7, 2011, at 11:59 p.m. Please leave a valid email address in each comment, as this is how the winner will be notified. Winner will have 48 hours to respond, or another winner will be chosen. Giveaway open to US residents only. Disclaimer:I was not monetarily compensated in any way for this post. All thoughts and opinions are mine. All quotes taken from the VitaminWater website. I would like to try the Stur-D flavor. I love Passionfruit. I would like to try Rhythm citrus in the Zero line. entered Unlimited mens shirt giveaway. I would like to try the starfruit citrus. entered bora bora bars giveaway. I would like to try Stur-D vitamin water. I entered the 3 sisters giveaway. i entered the Zevia givaway. I entered the Phit Grip giveaway. I entered the Gehwol Callus Cream giveaway. I entered the honest tea giveaway. I entered the violight giveaway. I entered the Fun on Foot book giveaway. I entered the Olympic Granola giveaway. I would like to try the Spark (Grape and Blueberry). Please enter me in this giveaway. Thanks! Like Vitamin Water on FB already. I'd like to try the Raspberry Apple flavor. I entered the redken giveaway. I entered the spri giveaway. I would like to try orange flavored rise! Entered Fun on Foot giveaway. I think the Dragonfruit sounds good. I follow Vitamin Water on Twitter. I liked Vitamin Water 0 on facebook and left a comment. I liked Vitamin Water on facebook and left a comment. AgroLabs Overnight Cleanse & Detox Review!! Nutra Sonic Face Cleansing Brush Review! Fila Toning Resistance Wear Review! Philip Pelusi Hair Care Review!! Olympic Granola Review and Giveaway (2 Winners)!! Lipo In A Box & Underology Skincare Review!! Truvia Natural Sweetener Review and Giveaway!! Gehwol Callus Cream-Review and Giveaway! Elements of Faith Book Review!! Zevia Natural Soda-Review and Giveaway! Kauffman's Fruit Farm-Review and Giveaway!! CalorieCount.com-You NEED To Check This Out! Mornings and Evenings With Spurgeon Book Review! Best Food For Your Baby & Toddler Book Review!! Vidazorb Belly Boost Review and Giveaway! The Ice Cube Diet Review! Sharon Mann Fitness DVDs Review and Giveaway! Creative Danes Water Jug Review and Giveaway! 191 Unlimited Men's Shirts Review and Giveaway!! Shenzhen Ceramic Knives Review and Giveaway!! TeeWit Review and $20.00 Giveaway!! Sony Ericsson Vivaz Camera Phone Review! Bendaroos Creativity Center Review and Giveaway! CSN Stores Jewelry Box Review!! ABC Neckties Review and Giveaway!! Aurora Plush Animals Review and Giveaway!! Rohto Eye Drops Review and Giveaway!! Ruth's Brownies Review and Giveaway!! Truth Be Told Game-Review and Giveaway! Zylie The Bear Review and Giveaway!! Udderly Smooth Creams-Review and Giveaway!